Poppy Flowers organic oil has the advantage of protecting the skin from daily stress. Is the ideal ingredient in the cosmetic treatment of dehydrated and exposed to environmental stress factors skins, preventing dehydration, irritation, wrinkles and premature skin aging. Due to its qualities, the Gerovital clay is a high valuable, natural cosmetic product, that could be used successfully in cosmetic formulations for treatment of sensitive skins (allergic, seborrhoeic, with acne or cuperosis, irritated and wrinkled) also for naturist cosmetic treatments, respectively by preparing of some instant masks. The skin will maintain or regain a fresh, young look. To obtain cosmetic masks, the Gerovital clay powder can be mixed with different fruits, vegetables, yoghurt, milk, honey, olive oil, egg`s yolk,etc., depends on the type of your skin. It is advisably to combine the clay powder with natural juices having astringent properties, obtained from tomatoes, lemons, cucumber, apricots, oranges, etc., for the oily skins, respectively with ingredients having moisturizing and nourishing effects: cucumber, celery, milk, honey, olive oil, egg`s yolk, for normal and dry skin. This product can successfully substitute talcum powder in babes`hygiene, and could be used as antiperspirant, and after-shaving, instead of o lotion. * Continue the treatment applying the other Aslavital line products. Cucumber, Celery, Milk, Honey, Olive oil, Egg`s yolk, Clay powder, etc. Provides gentle and efficient washing of the face without drying the skin. The elastic film removes dead cells and other impurities and helps unclogging pores. 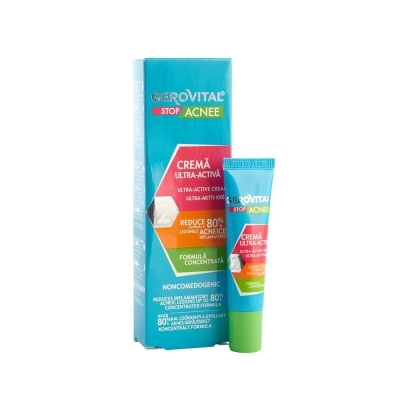 It is a daily care cream for seborrheic, mixt and acneic skin, for glossy and irritable skin. It has a mild, pleasant, non-clammy structure, with a rapid absorption, which reduces the sebum excess and restores the feeling of comfort. Skin becomes clean and mattified. 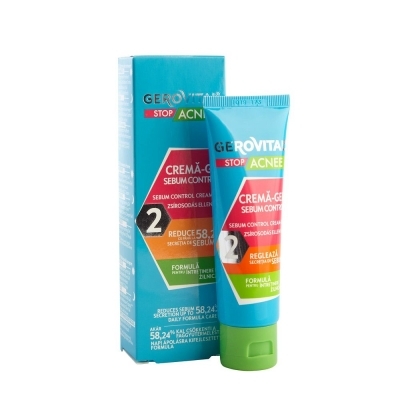 Gerovital Ultra Active Cream acts directly upon the acne lesions, provides anti-microbial protection, medicates the comedos and heals the existing papules. The Lactic Acid removes the devitalizes cells of the horny layer opening the pores and facilitates the action of the other active ingredients. The Irgasan, together with the Anti-Acne Extract and Sulfur provide anti-microbial effect, while the Boswelia Serrata Extract helps by lesions healing. A smooth skin without acne lesions. 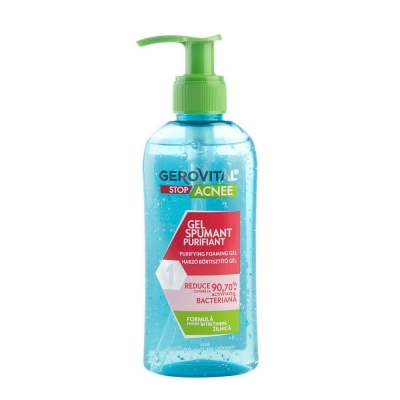 Use in the evening, after previous skin cleaning with the Gerovital Plant Acne Stop - Anti-Microbial Foaming Gel. Apply in a 2-3 mm thick layer on the affected areas and let it act over the night or at least 60 minutes. then remove with a cosmetic pad. It can also be used in the morning or during the day - in this case apply in thin layer and massage gently untill it is completly absorbed by the skin. For optimal results, it is advised to follow the steps appointed in the treatment scheme with the "Gerovital Plant Acne Stop" products, treatment that was dermatologically tested by our specialists. 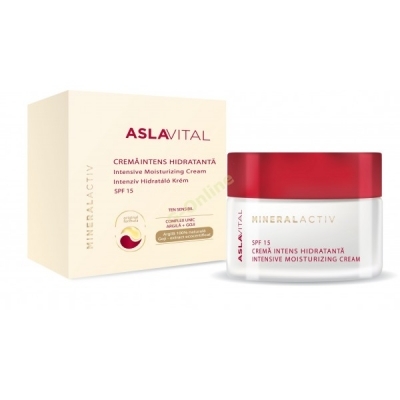 The Aslavital Ultra Active Lift Cream, has a great smoothing effect of the wrinkles, improves cellular regeneration, rejuvenating the skin and creating a very pleasant silky sensation. The Gatuline Expression extract and Clay, provide unique anti wrinkle effects. By quickly blocking the spontaneous contractions of the face muscles, the Aslavital Ultra Active Lift Cream has an instantaneous smoothing effect and the wrinkle reduction is visible after only one application day. The skin microrelief is improved after only 10 days of using the cream. The Boswellia Serrata extracts and Clay have an important soothing effect of the epidermis, activating blood circulation and fighting against dark circles and pouches. Skin hydration is provided by the Natural Oils complex (Sheea Butter, Soy Oil, Squalane) associated with clay and natural active principles. The Ferulic Acid And Vitamins A and E, reduce the fine lines, pigmentation spots, increase skin elasticity, stimulate the production of elastine and collagen and prevents the destruction effects of UV radiations. The vegetal phyto-hormones replenish the deficiencies of mature skin and stimulate the cells regenerating process. Thus, the fine lines, wrinkles and pigment spots are reduced, the skins elasticity increases, the elastin and collagen production is stimulated and the destructive action of the UV radiations is prevented. The unique complex of Natural Clay organic Goji berry extract has mineralizing, energizing effects and it restores the skins vital functions, preventing and treating the wrinkles. The cream reshapes the face contour, restoring its smooth, firm, velvety and luminous appearance. Apply in the morning and in the evening on the clean face skin. Eco certified Goji berry extract 100% Natural Clay Sensitive skin. It efficiently cleanses the skin and has remineralise, energizing effect. Directions: Gently massage and then remove with a cosmetic pad. Eco certified Goji berry extract 100% Natural Clay. The product ensures delicate cleansing for sensitive skins. Apply a small quantity of cream onto the wet face, avoiding the area around the eyes. Gently massage and then rinse with plenty of warm water. The vials assist the skin in its essential functions while hydrating, detoxifying and speeding up cellular regeneration. Following application, visible signs of aging are reduced, free radicals are being neutralized, leaving skin smoother, invigorated and better protected. May be used alone, or in association with other complementary products: moisturizers, serums, UV protection skincare. The product ensures protection against the oxidative stress through the Ferulan Complex (Rice Bran Oil and Ferulic Acid), increasing the skin protection level and giving it a younger and healthier appearance. The unique complex of natural Clay – organic Goji berry extract has strong skin and cell energising effects, it regenerates, moisturizes and tonifies the skin. Get the serum entirely at the bottom of the ampoule, and then place it with the breaking point forward. For hand protection, wrap the ampoule in a tissue before breaking it. Pour the ampoule content into the palm of your hand and apply on the freshly cleansed skin by gently massaging it. The entire content of the ampoule is used for a single application! Once the serum is absorbed, apply the Aslavital Mineralactiv daily care cream. Use the ampoules in the morning or in the evening. Avoid contact with the eyes! DERMATOLOGICALLY TESTED For external use only! Based on Retinol, this cream penetrates deeply into the dermal layers, accelerating the enzymatic process, therefore preventing the appearance of wrinkles and slowing down the skin's aging process. 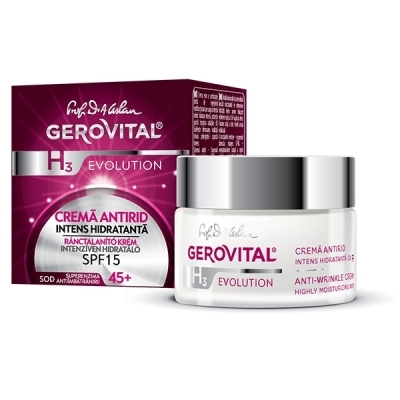 The cream is a Gerovital unique formula, scientifically developed to maximize cellular regeneration processes which slows down the physiological ageing of your skin, improving its look, its firmness and its elasticity. The Sepilift Complex that is an important part of this Gerovital formula also fights to diminish wrinkles and increases elasticity of the skin, while natural oils such as Soybean, Squalane, Shea Butter) and the Boswellia Serrata Extract soothe, regenerate cells and prevent any possible skin irritations. 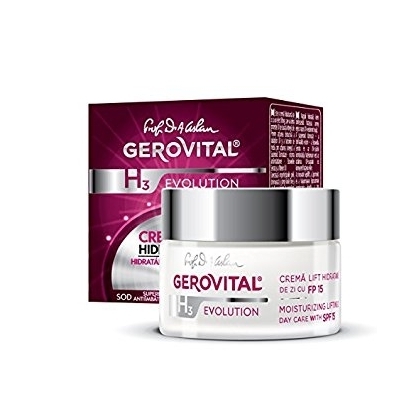 This unique cream based on an original Gerovital formula acts fast to protect, repair and restore a fresh and firm look for the sensitive area around the eyes. It brings back the softness and the natural young look to the area surrounding the eyes, eliminating wrinkles and restoring the skin cells. Retinol is the ingredient that accelerates the enzymatic processes and cell division, assisting the skin to become more capable of self-regenerating from within. Sepilift, Vitamin A and Vitamin E enhance the wrinkle reduction effect, restore the skin's elasticity and firmness and prevent the appearance of new wrinkles in this highly delicate area. The Boswellia Serrata extract that is part of the formula has a soothing, anti-irritating, calming effect that ensures additional protection for your sensitive skin. The daily use of this product is highly recommended in order to prevent and minimize the aging signs, while mentaining a fresh look at skin level. The Gerovital H3 "2 in 1 Moisturizing Cleanser" has a perfect cleansing impact on your skin, while deeply mosturizing it and toning it at an optimum level. Simultaneously, the Vitamin E, a key ingredient of the formula, has a strong anti-aging effect, as it delays the metabolic aging process. This product ensures the perfect setup at the skin level for the application of cosmetic products. It is reccommended to apply the product twice a day, in the morning and in the evening, on your face, your neck, while focusing on sensitive areas such as your eyes or your décolletage. Massage it gently, then remove with a cosmetic pad. Skin type: Dry skin, Mature skin, Dehydrated skin. 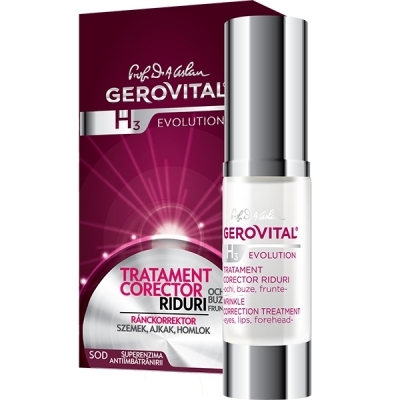 This innovative anti-aging formula maintains and treats mature and dry skin, having a geriatric anti-aging effect. The cream deeply moisturizes the skin, it reduces wrinkles and prevents the occurrence of new ones. The use of this cream is highly reccomended for wrinkle prevention, but also for the treatment and reduction of visible wrinkles. 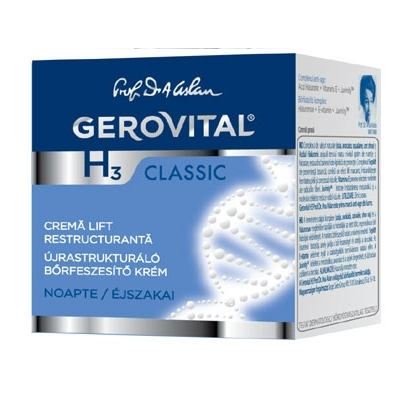 This Gerovital H3 cream brings back the freshness, elasticity and vitality of your skin and it is one of the most popular Ana Aslan products. The cream's structure is very rich in natural oils and fats. As a result, it restores the hydro-lipid protective layer of the skin. The Hyaluronic Acid that is part of this unique formula provides the perfect balance between the natural water reserves in the dermis and daily transepidermal loss of water. It is reccomended to use this cream daily, every morning. Apply it on the face, neck and décolletage. 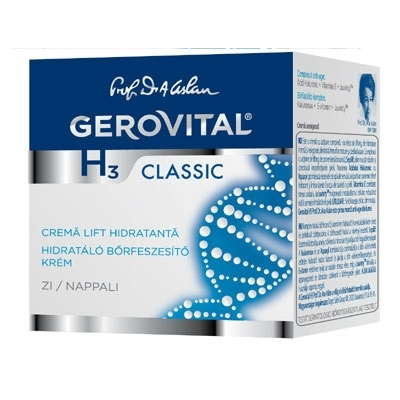 The Gerovital H3 Moisturizing Lift Day Cream has a tremendous lifting effect and an intensively moisturizing and reinvigoration impact on your skin. The cream is based on a formula especially developed for mature and dehydrated skin types. Sepilift, the complex with lifting action effect that is part of the product's formula, aggresively reduces wrinkles and corrects imperfections at deep skin level, not only at its surface. The balanced combination of other ingredients such as the Hyaluronic Acid and the Aquaxyl, provides a powerful moisturizing effect and improves skin’s barrier function. The Vitamin E offers anti-oxidant protection to your skin, while Juvinity reinvigorates the metabolism of the skin cell, delaying the aging visible effects and providing a fresh and energetic look to your skin. This cream is rejuvenating your skin at cell level, preventing and diminishing the wrinkle effect overnight. The results is a fresh, young, long-term pleasant look. This original formula based on a complex of natural oils (Soybear, Avocado, Sqalane, Shea Butter) and Hyaluronic Acid provides optimal nutrition and moisturizing for your skin, restoring its hydro-lipid protection barrier. Sepilift complex of botanical origin generates an important lift effect, it improves the firmness of the skin and it corrects the wrinkles, while preventing the occurance of new ones. Juvinity™ delays the natural metabolic process of aging, operating at cell level to visibly reduce wrinkles. Deeply hydrates skin, protects and helps repair environmental damage. Powerful ingredients like Lipomoist™ 2036, Sepilift™ DPHP offer instant hydration, natural clay and Cobiodefender EMR fight urban and electronic pollution, while natural oils leave the skin feeling soft and comfortable. The product ensures protection against the oxidative stress through the Ferulan Complex (Rice Bran Oil and Ferulic Acid), increasing the skin protection level and giving it a younger and healthier appearance. The unique complex of natural Clay, organic Goji berry extract has strong skin and cell energising effects, it regenerates, moisturizes and tonifies the skin. * The product ensures protection against the oxidative stress through the Ferulan Complex (Rice Bran Oil and Ferulic Acid), increasing the skin protection level and giving it a younger and healthier appearance. The unique complex of natural Clay, organic Goji berry extract has strong skin and cell energising effects, it regenerates, moisturizes and tonifies the skin. With a film-like texture, the mask offers a brighter, more refreshed and luminous complexion. Activated charcoal absorbs impurities and excess oil, offers a light exfoliation, improves the appearance of pores, enhanceing the overall detoxifying and purification action of Clay and Cobiodefender EMR. 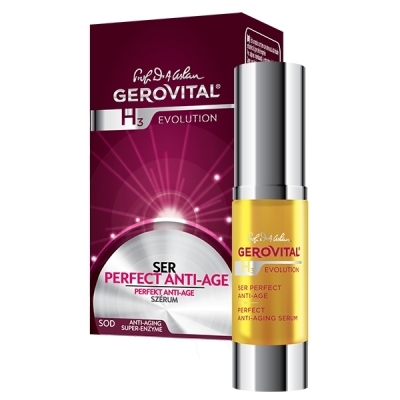 Gerovital makes your skin beautiful and flawless! 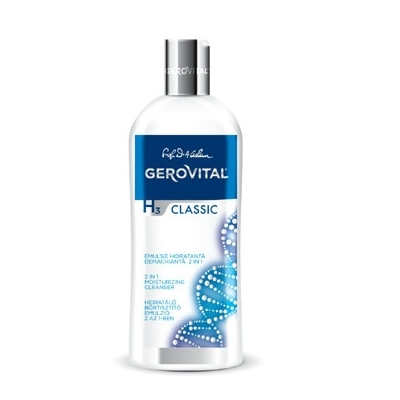 Gerovital offers you a wide range of face care products from gentle cleansers, foaming gels, purifying corrector sticks, sebum control creams to anti-aging formulas for every skin type and tone. Your skin is exposed every day to stress, environmental factors and can become sensitive. You need gentle formulas that will re-awaken your skin. 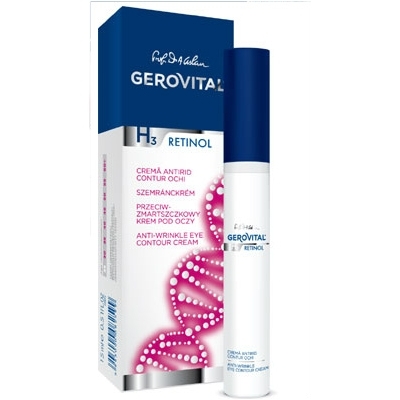 Experience Gerovital’s dermathologically tested formulas to revive your complexion. 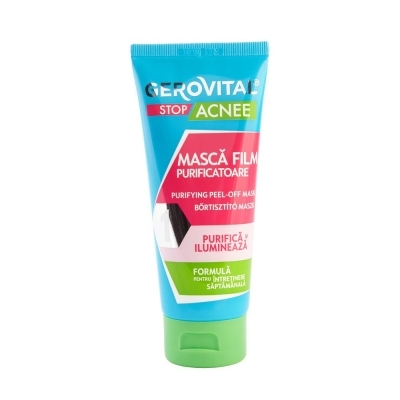 Keep your pores clear and reduce acne with our purifying range of products. We offer you anti-blemishes formulas that will clean and fortify your skin. The plant extracts generate an anti-microbial protection and keep the secretion of sebum under control. Over the years your skin loses its natural elasticity that is why you need a proper skin regime. 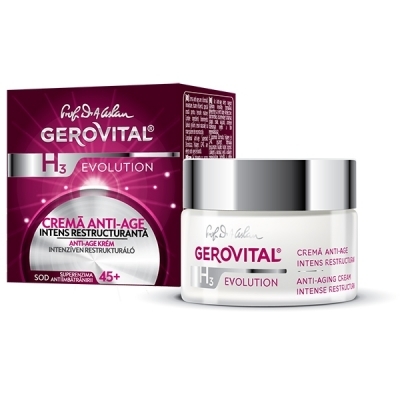 Gerovital anti-aging formulas will help you keep your skin young and beautiful. The H3 Revolution products provides powerful anti wrinkles effect and revive your skin by keeping it young, soft and radiant. Dry skin is a common problem amongst women. When the skin does not produce enough natural oils, becomes dry and more sensitive. A good moisturizer repairs the skin, prevents water loss, and improves elasticity and deep nourishing. Our efficient moisturizers prevent dehydration and premature skin aging. A healthy lifestyle and professional skin care products can help you revive your complexion and prevent any skin problems. Pamper yourself with our special skin care formulas. 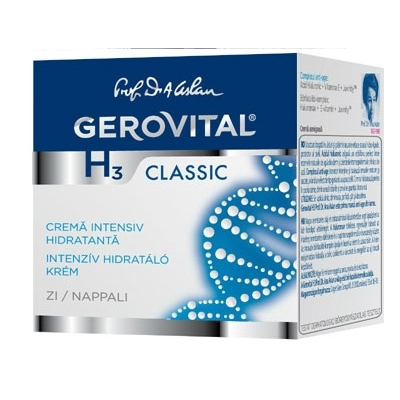 Gerovital - Skin care has never been so easy!